Copper is no stranger to building construction. Copper, brass, and bronze have been used for centuries by builders for a variety of architectural applications including roofing, cladding, ornamental systems, and other design elements. 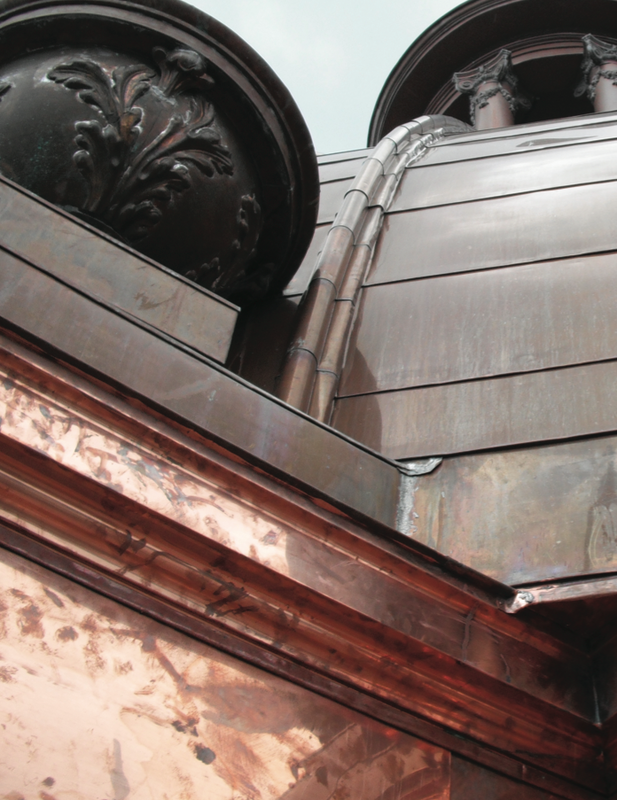 Its resilience, versatility, and longevity are just some of the reasons why the original copper is still found on many historic buildings, including churches, academic facilities, and government offices throughout North American and around the world. The Copper Development Association (CDA), in conjunction with Green CE/RBA, recently hosted a webinar for design professionals interested in working with copper titled ‘Copper in Architecture.’ The webinar introduced copper design basics and explored many architectural uses, finishes, and service-life benefits that copper offers. Known as mankind’s oldest metal, copper delivers unparalleled beauty while providing durability, longevity, and workability, making it a popular and preferred building construction material by architects, installers, and building owners. enhances the appearance of statues, roofs, and other decorative and architectural applications. While all structures experience wear-and-tear, architects and contractors can trust copper to provide exceptionally long performance with minimal maintenance. As a result, this metal is often used on buildings designed to last a lifetime, or longer. Copper is also malleable—it can be formed, bent, and stretched into complex and intricate surfaces with- out breaking. This makes it ideal for the most complicated shapes, such as those found on spires, steeples, domes, non-linear roofs and walls, complicated dormers, cornices, and the like. 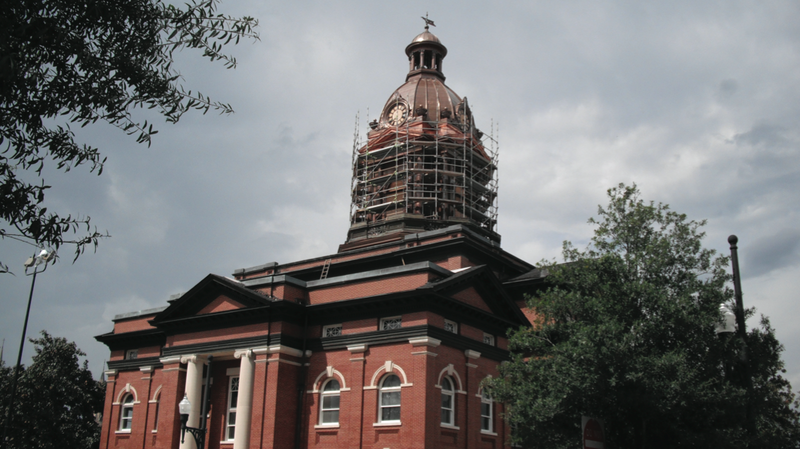 Malleability certainly came in handy when restoring the historic Coweta County Court House in Newnan, Georgia. Restoration, closely managed by acclaimed Atlanta architectural firm, Lord Aeck Sargent, included replacement of copper on the 106-year-old dome topped cupola to preserve this American architectural classic. Steinrock Roofing & Sheet Metal Inc. carefully replicated all decorative and structural sheet metal pieces for the neoclassical court house dome and cupola to match original details. Attesting to copper’s durability, much of the intricate copper work on the building’s fascia and cornice required only limited attention. As a result, the Coweta County Court House was one of two Georgia projects recognized with a North American Copper in Architecture Award (NACIA) from the copper in- dustry in 2010. The annual award, managed by CDA, awards only about a dozen new and recently restored buildings in the U.S. and Canada that utilize architectural copper and copper alloys in their design each year. While copper was used to protect and adorn some of the most important and prominent national historic landmarks in the U.S., the metal continues to play a significant role in construction today because it can be used in new and innovative ways, such as intricate wall-cladding systems and elaborate rain screen walls. Such was the case with the Marcus Nanotechnology Research Center Building at the Georgia Institute of Technology in Atlanta—the other NACIA award recipient from the peach state that year. A 22,000- square-foot copper panel screen wall harmonizes the building’s architectural elements with the adjacent campus landscape, while providing beauty and sustainability through its naturally-weathering and low-maintenance qualities. CDA building construction specialists serve as a resource for architects, contractors, and engineers seeking technical information and assistance on the use of copper and copper alloys. They are skilled in regards to copper sources, energy efficiency, architectural design practices, and sustainability. In addition to the webinar, CDA provides architectural seminars for design professionals interested in working with copper. Sheet metal and roofing contractors need not feel left out. CDA offers multi day in-shop copper roofing system training for as few as six students at a nominal charge. For more information on technical assistance, seminar, and training programs, or to view project briefs on past NACIA projects, visit www.copper.org. This entry was posted in Technology and tagged architects, Copper, design, materials, sustainability. Bookmark the permalink.